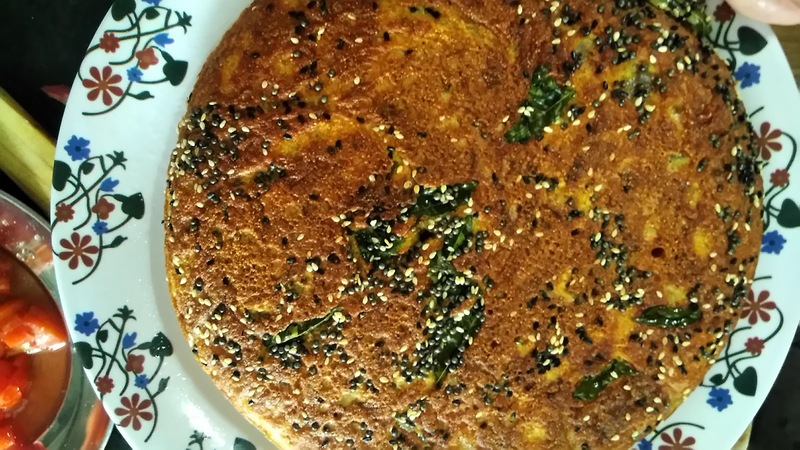 Handvo is a very famous and traditional Gujrati breakfast recipe. Authentically it’s made with dal (lentils) and rice and bottle gourd (lauki) with some more vegetables. Since it’s a little long process, as you need to soak it first and then keep it for fermentation. But this one is an instant version. 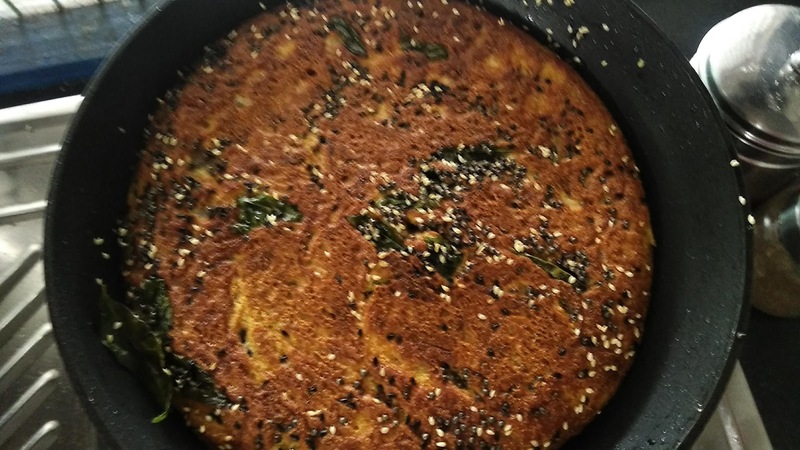 It’s made with suji and besan and with vegetables. I have not used lauki here, which is completely optional. This version too is very healthy and light to have. It can be served in breakfast but I like to pack in kids school lunch box. 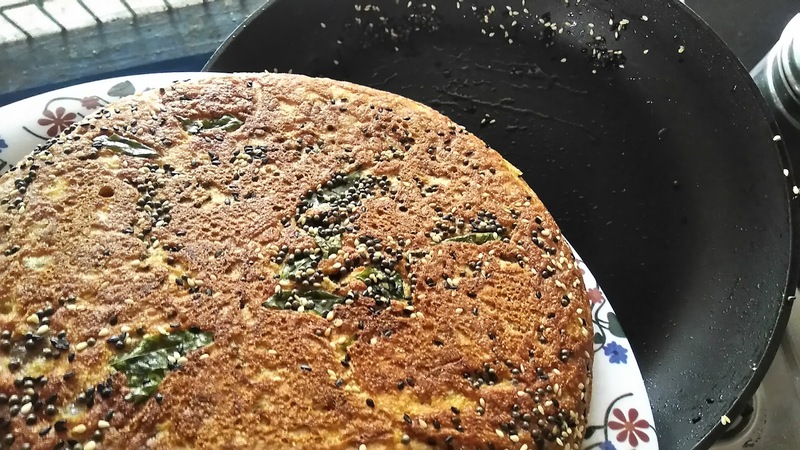 The best part of this recipe is even after becoming cold you can enjoy it. This is one of the latest crush in my home these days. I am sure your family will love it too. Just follow the exact measurements and enjoy this healthy breakfast. 1. Mix together besan, suji,curd, salt, water, turmeric powder, coriander powder. Make a smooth and lump free batter. 2. 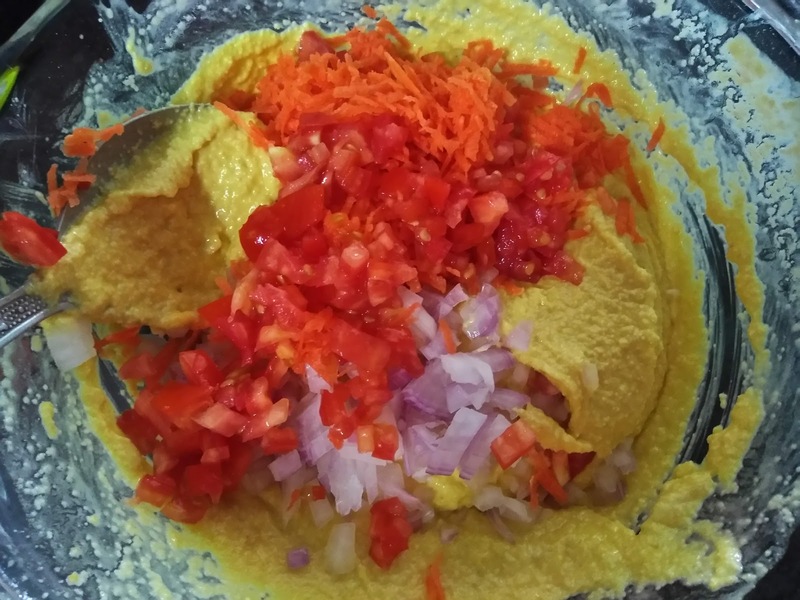 Add onion, tomato, carrot. Cover and keep this batter aside for 15-30 minutes. 3. 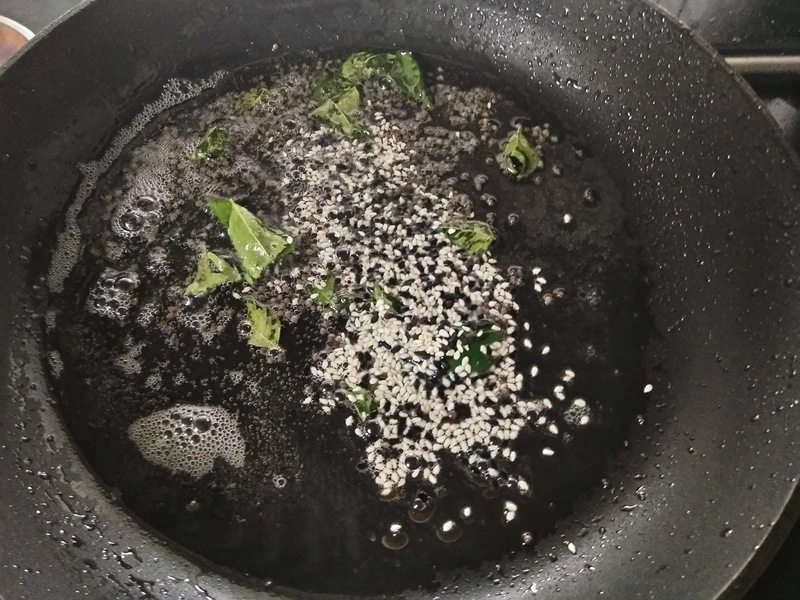 After 15 minutes, heat oil in pan, add mustard seeds and let it splutter, add curry leaves and white and black sesame seeds. 4. 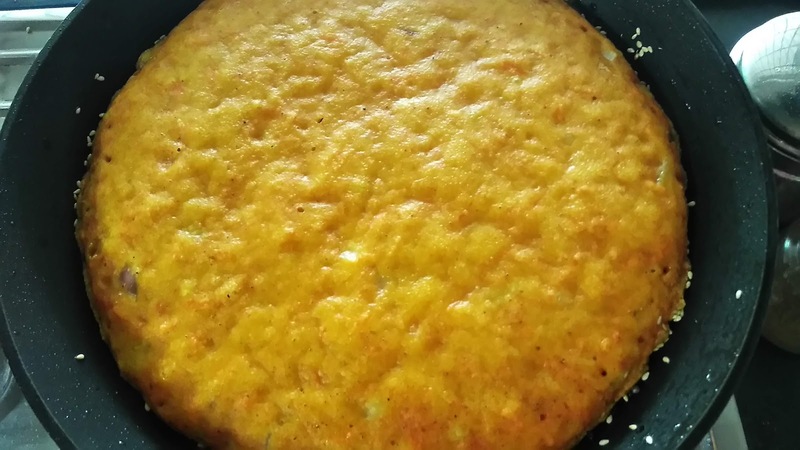 Add soda (mix well) in batter just before pouring it in pan, cover and cook on low flame for 8-10 minutes, After 10 minutes, the top part should be cooked, it should not be sticky. 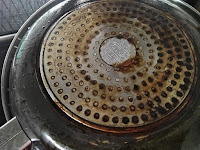 At this stage, keep plate on top of pan and turn it upside down to take out the handvo. 5. 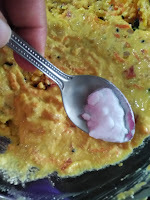 Now again add oil, let mustard seeds splutter, then curry leaves, sesame seeds and slide handvo back on tadka, cover and cook for another 5-10 minutes on low flame. Here don’t try to lift the handvo just slide it to avoid any breakage. 6. Slide in serving tray, slice and serve hot! 1. 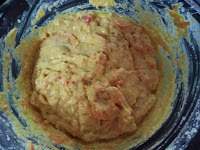 Mix together suji, besan,curd, salt, turmeric powder and coriander powder. 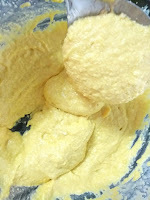 Add water and make lump free thick batter. Keep aside for 30 minutes, if running out of time then 15 minutes. 2. 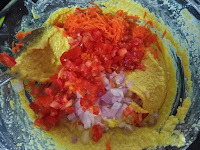 Add chopped onion, chopped tomato and grated carrot. 3. Mix well. Cover and keep aside. 4. Heat oil in pan, add mustard seeds let it splutter, add sesame seeds and curry leaves. 5. Add soda in batter. Mix well. 6. 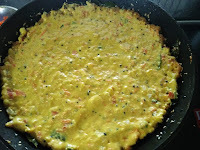 Pour the batter over tadka. 7. 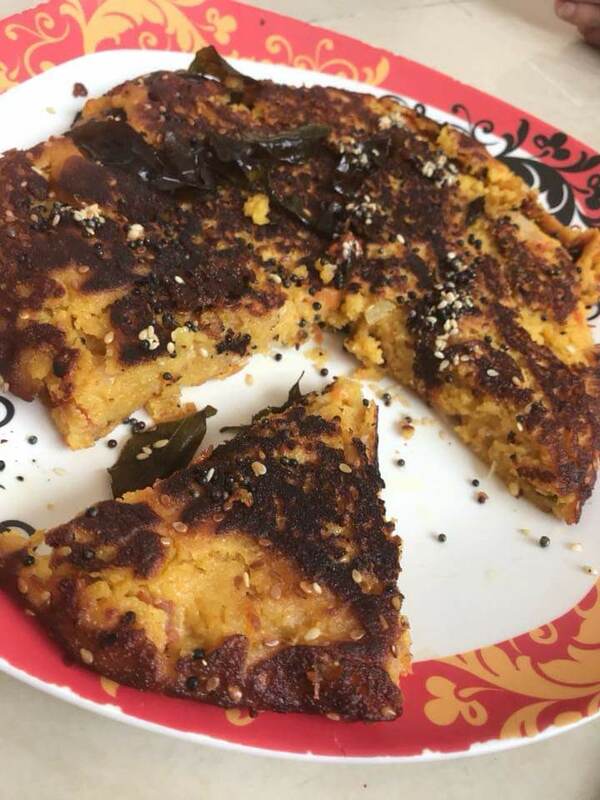 Cover and cook for 10 minutes. 8. 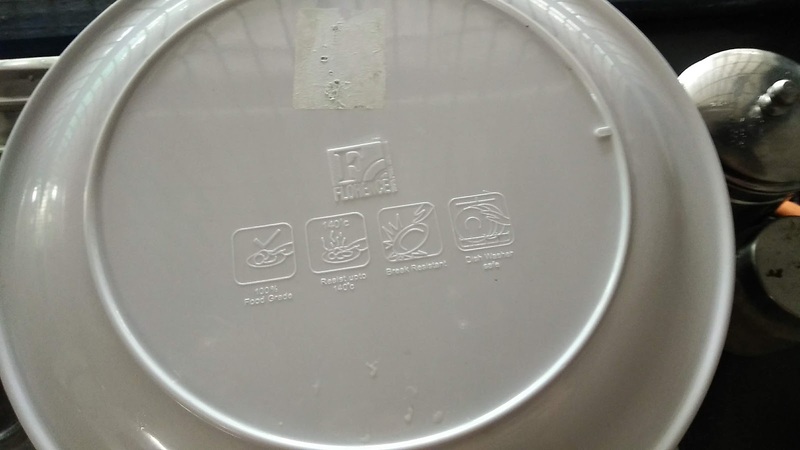 After 10 minutes, you will see it’s done from top. 9. Keep plate on top and flip to take out the handvo. 10. Turn the pan upside down. 12. 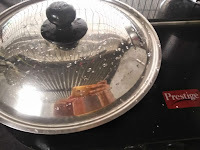 Again add oil and give same tadka. 13. Slide the handvo on it. Try not to lift. 14. Cook for another 5-6 minutes. 15. Transfer in serving plate. Let it cool down a bit. Payal Bhatia tried Handvo with this recipe and shared her feedback! Thank you Payal for sharing your valuable feedback!